The School of English for Engaged Social Service (SENS) is a place for learning English as a tool for leadership, self-cultivation, and social transformation. It is a three-month course that takes place annually from January to April at the Wongsanit Ashram near Bangkok. It is very difficult to set a life direction or to lead others if you are doubtful or unsure of your own voice, of your own value, or of your own place in the world. Mindful and compassionate leadership is urgently needed in the world at this time, yet many of us are in fact doubtful. In SENS we recognize that this doubt is widespread, for many reasons. It is a doubt that can be especially deep for women, for members of minority ethnic groups or oppressed nationalities, or for those who grew up in challenging circumstances. Yet we know on principle and from experience that every human being who receives the necessary support has the potential for profound leadership. What is that necessary support? We do everything we can to appreciate the beauty and goodness of each participant in the course, as they are now, blemishes and all. We do this by appreciating them verbally, by soliciting their stories and opinions, and by listening to them with genuine respect and thoughtful attention. We de-emphasize critique, because everyone has been criticized and corrected so much that they become overly watchful of what they do, fearful that they won’t do something right… or worse, that they could never be right enough. We think our students, like all of us, need to be reminded of what is already right. Once they know we genuinely see their goodness and beauty, it is quite easy for them to accept suggestions, critiques, and corrections when needed. We also make an effort to get to know each of the participants in the course well enough to know what kind of support each one specifically needs. We try to keep track of their personal growth throughout the course, so that they can overcome even very personal and subtle but persistent obstacles. In trying to do these two things, we often fall short, and we sometimes fail completely, though that is rare. The important thing is that we also succeed. And we have become consistently better at learning how to support both individual participants and the group as a whole. As evidence of those successes, we include here some of the reflections and goals that students shared at the 2018 SENS graduation ceremony held on April 4, 2018, generously hosted by Dr. Pichai at his Maenam Resort Nakhon Chaisri. Students crafted their own statements, but they received help with English phrasing, and their final statements have been edited for clarity. We are limited by space in this issue, but we hope to offer more of our students’ voices, and share more about what we learned this year, in upcoming issues. If you are inspired by what you read here, you may help in one of two ways: 1) by spreading the word about the SENS program; or 2) by donating to the SENS Scholarship Fund: http://inebinstitute.org/donation/. Next year’s course runs from January 6 to April 3, 2019. To be an effective leader you need to be able to respond to challenges with intelligence, strategy, and sincerity. About the socialization and internalization of gender inequality through two wonderful women, Ouyporn and Ginger. How important it is to have Kalyanamitra in one’s life. When people have the same values, they naturally come together in unison in some ways. The importance of listening to what other people have to say. How climate change impacts everything and everyone’s life, and that even our civilization is at stake. This student has asked to not be identified. As an adult, I haven’t shared my feelings with my parents that much. But learning counseling has encouraged me to share more with them and also to listen to them. …. Before this course, I didn’t have proper goals for my life. I just tried my best wherever I was or whatever I was doing. But now I see the value of identifying my goals and the steps I need to be able to reach them. 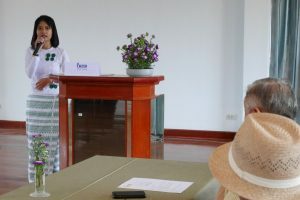 Thet Nwe Soe – Metta Development Foundation, Myanmar. To do regular practice for improving my English skills into advanced level in 2018. To listen deeply to my friends and community when they need someone to listen. To do research about the traditional environmental conservation customs and beliefs of ethnic groups and how to create an environmentally friendly culture in my country. I aim to complete this research within two years. To initiate an Eco Campus Movement at universities in my country that will go broader and deeper. 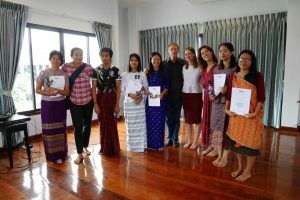 Phoo Pwint – Kalyana Mitta Development Foundation, Myanmar. I want to create a space in the countryside where youth can come to learn skills outside of school and access resources for personal development, including scholarships to study abroad, workshops and trainings, as well as community and network-building. These are not new ideas. But this course gave me the confidence I needed to move forward with them. Thank you to the SENS community and to all of our supporters for giving me the opportunity to learn more English. Samkham Meunsy – PADETC, Laos. 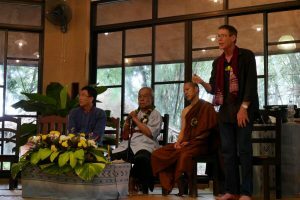 The School of English for Engaged Social Service (SENS) proudly takes its name from the School of Youth for Social Service, which Vietnamese monk Thich Nhat Hanh founded in 1964-65 to meet the crisis in the Vietnamese countryside created by war. 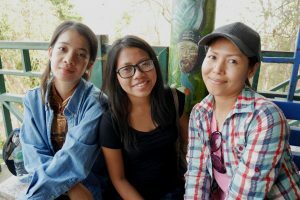 The School of English for Engaged Social Service was founded by Sulak Sivaraksa and others in 2015 to meet the crises of climate change, increasing social inequality, and individual confusion and despair about what to do. Its aim is to create a safe and supportive place for learning English as a tool for leadership, self-cultivation, and social transformation. “Engaged” means that we learn to support each other with our mind, our senses, and our spirit fully present. It means that we work in service to society and all living beings from a place of openness and vulnerability, respecting the dignity and equality of those we encounter and assist, and ready to learn from them. “sense” as in the five senses. We rely on our experience, made possible through the senses, to test and to experience what is true, and to learn from experience what creates peace, clarity, and confidence. “instinct,” or to have an “intuitive sense” of things. 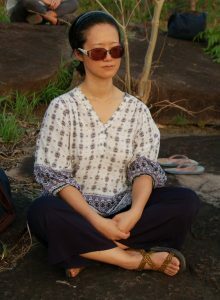 Over time our mind builds up an intuitive sense of what to do, what to say, or how to behave. We can say, for example, a sense of humor, a critical sense, an aesthetic sense, or importantly, a moral sense. A moral sense helps us discern quickly what is important, what is going on, and how we can best respond. “judgment” or “reason” In French you can say “a mon sense,” which means “to my mind” or “in my opinion.” “Le bon sense” means “good sense” or “common sense.” We rely on reason and good judgment. “meaning.” We are always invariably interpreting the meaning of life and what goes on around us. Now it is important to understand the meaning of our time, and how it beckons us to respond. “direction” or “way.” Responding intelligently and boldly to the crises of the present requires that each of us set a personal direction that grows out of our genuine desire, love, and commitment. It also means that we agree on common goals and learn to cooperate and work together for a humane future for everyone.